The Tailspot Blenny – (ecsenius stigmatura) an active and beneficial member of any reef aquarium. The Tailspot Blenny has a cartoonish like head with big eyes and a long slender body. Its colors are striking with its most dominant feature a large spot at the base of its tail. These peaceful herbivores need live rock where they can hide and graze on algae. They do not require any special care other than peaceful tank mates. If algae isn’t available, supplement their diet with Nori seaweed and other herbivore foods. As with all Blennies, the Tailspot Blenny can jump. A tight fitting lid is a must. This popular fish is recommended for beginner and advanced tanks alike. They can grow to 2-3 inches and the minimum tank size should be 30+ gallons. 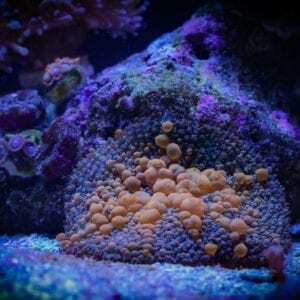 They thrive well in standard reef setups with water temperatures ranging from 73-78 degrees and a PH of 8-8.4.